The Aviva Stadium in Dublin is set to host an American college football game in 2016, which will be the third time in five years such a sporting event will be staged in Ireland. 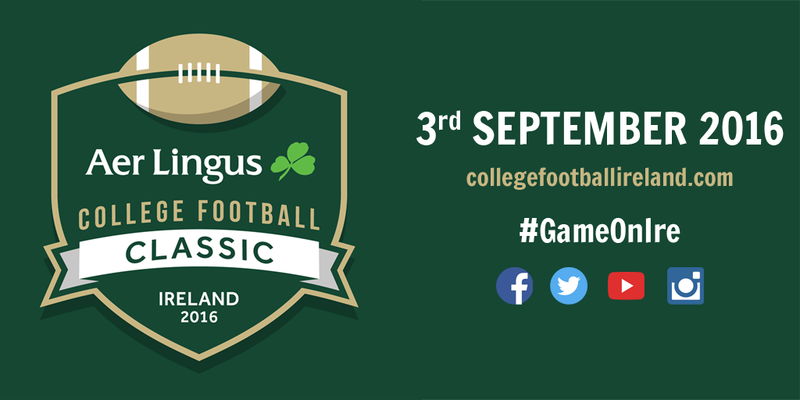 The Aer Lingus College Football Classic will see Boston College take on Georgia Tech at the Aviva Stadium on Saturday, 3rd September, 2016. The big announcement was made at the reception in the Mansion House in Dublin by An Taoiseach Enda Kenny TD, which was followed later in the day by a similar launch at the Boston College Campus in the U.S. attended by the Mayor of Boston, Marty Walsh. The principle Title Sponsor for the game will be AerLingus which sees the Boston College Eagles kick off their 2016/17 NCAA Division I College Football Season in an Atlantic Coast Conference game against the highly competitive Georgia Tech Yellow Jackets. It is hoped that the Aviva Stadium will be full to capacity for the event with almost 48,000 expected to attend. As many as 25,000 are expected to make the trip to Ireland from the US and Europe for the game. Tickets for the big game won’t be going on sale for another few months yet but a range of special vacation packages to Ireland were made available in the US in addition to the corporate hospitality facilities at the Aviva Stadium. “This is great news for our tourism and the Irish economy; in 2012 and again last year September we witnessed a huge surge of US visitors to our shores for the Emerald Isle Classic and the Croke Park Classic and I have no doubt given particularly Boston College’s close links with this country we will see another spectacular success in 2016. Sports tourism and events like this College Football game have become increasingly important as we look to build and develop our tourism industry and I want to thank Boston College President Fr. William Leahy for his support in making this game a reality”. “Our history and our connections with Ireland are well known, we are very proud of our campus on Dublin’s St. Stephen’s Green. 2016 is a very special year in Ireland’s history and we are particularly pleased that we will be travelling with hopefully tens of thousands Boston College supporters to share in those celebrations and enjoy this important conference game with Georgia Tech”. This entry was posted in Activities in ireland, dublin, Flights to Ireland, Fly to Ireland, Ireland, Ireland Travel, Ireland Vacations 2015, Irish Americans, Sport in Ireland, Visitor Attractions and tagged Aer Lingus College Football Classic, Aviva Stadium, Boston College, Boston College Eagles, College Football Classic, college football ireland, enda kenny, Georgia Tech, Georgia Tech Yellow Jackets. Bookmark the permalink.